There is Bagheera, Baloo, Shere Khan and King Louie. There are the elephants, vultures and wolves. But you’ve never seen the characters of the 1967 classic The Jungle Book behave like this before. They look like the singing, dancing characters of Disney’s original, but they act like real animals in the zoo. In another video a woman emerges from a building carrying a tray of drinks, the film slowed down so much that her movements are almost frozen. Observing – close-up – you feel part of an intimate series of silent motions, seeing something that might usually go unnoticed. But as the camera pulls back the shadows on the walls are revealed. They move quickly, tracing hours in just a few moments so that you realise that the video consists of two very different timescales, minutely edited together to create a single, seamless – yet impossible – scene. Created by the Belgian artist David Claerbout these videos are composed with great subtlety and subterfuge. They are part of an exhibition at the University of Edinburgh’s Talbot Rice Gallery that presents six of his intriguing explorations of image-making. A cat and bird sit alongside each other in another of Claerbout’s videos. What they are doing – you might say – is not killing each other. As simple as it may seem this small video piece runs against our expectations and in doing so highlights an aspect of how we perceive the world. In this case we perceive something, a natural animosity, which is not there at all, but has been conditioned by deep-rooted assumptions. A giant slideshow on the main wall of the exhibition shows people gathered on a beach for some unknown purpose. It is a moment captured from lots of different angles, but it is hard to imagine how it could have been achieved and where the significance of this event lies. As with many of Claerbout’s works there is also a clear recognition of the changes taking place as a result of digital technologies. Upstairs, a camera-less film takes you on a convincing journey through a woodland (Claerbout gives just enough away, for example by shifting foliage types from European to Amazonian to make you question its veracity). Yet when the ‘camera’ retreats out of a small grove into a largely flat farmed region that could never contain the woodland you realise Claerbout is playing with expectations about how reality should behave. Another work frames an image of a beautiful ornamental garden – accompanied by sounds of birdsong – only to pull back to reveal that it is a poster on the wall of a bleak modern apartment building. Forced to re-evaluate what you are seeing, these works make you consider the connections between the precarious position of meaning in the digital realm and our modern living conditions. Throughout the exhibition you get a gnawing feeling that something strange is going on. The works are gently unsettling, difficult to pin down. And this is precisely why Claerbout is internationally recognised for work that is truly affecting. With the disquiet or suspicion his work instils you are able to really feel out the seams that connect the fabric of reality with the fabric of images. If you want to find out more then check out David Claerbout’s artist talk at Edinburgh College of Art, which is part of the Festival of Creative Learning. The exhibition David Claerbout runs at Talbot Rice Gallery from 24 February – 5 May 2018, admission free. For more information please visit www.trg.ed.ac.uk. 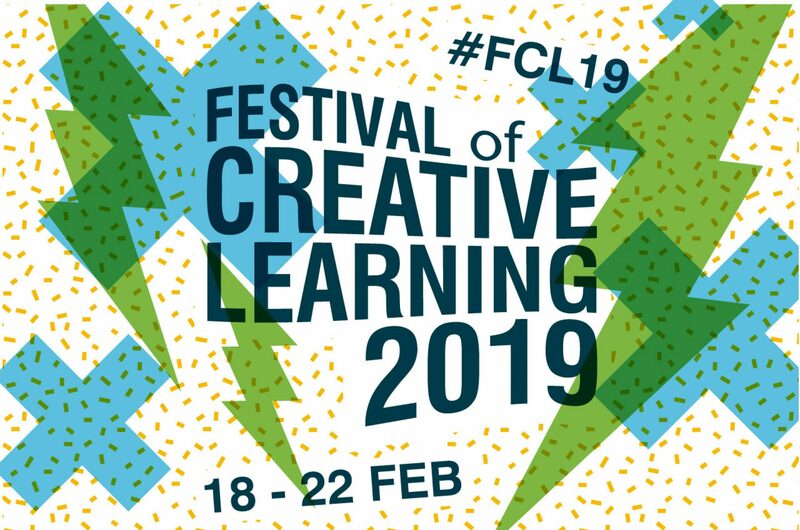 Well I can’t quite believe it, but the Festival of Creative Learning is nearly here again, and it is shaping up to be one remarkable week! Last year I had only just started a few months before the Festival, so it felt as if the main task was getting my head around what in the world it all was and how best I could help support the brilliant organisers to realise their dream events. It was a wild ride of a Festival and there are so many memories I treasure, even though I managed to come down with a not very creative cold. In spite of that, I sniffled and sneezed my way through the Birds and the Bees board game, finding penguin love to the jungle music of monkeys and birds in Potterrow’s trees. I watched the bright colours drawn out of the dyeing vats by attendees at the Edinburgh Medieval Pigment Project’s event (they’re working their natural magic again this year! Check it out at: Colouring Outside the Lines: Medieval Pigments & How to Use Them. I loved seeing so many smiling faces folding double headed swans in concentrated silence at the Hyperbolic Origami session. My wonderful and patient colleague, Lucy Ridley, and I then spent the summer reviewing our processes and the feedback we received from organisers and attendees of the Festival. We came up with a whole raft of experiments to implement in order to test what we could streamline and smooth. We have been delighted to see these changes bearing fruit, as we have worked with partners to update and re-skin our website, have slimmed down and tightened up our application forms and administrative processes and have switched up the way we communicate with and gather together our organisers. All in all the changes seem to be working to make the Festival even more creative, energised and enjoyable than before – hooray! This year we have a remarkable number of events across an extraordinary range of topics and activities. I can hardly look at the events programme (with the help of our new and improved handy calendar search widget) without wishing I had a cloning machine as I want to go to EVERYTHING! Keep an eye out for Lucy and me in our Festival Hoodies – we will be popping into events throughout the week and would love to hear all about your Festival experience. You’re all doing such a brilliant job – please do keep spreading the word about the Festival and your events. We recommend social media (be sure to use #FCL18 and we will repost), lecture shout outs and popping into other events to spread the word. Remember that promoting the events of others can often mean that they will spread the word about your event so support others and trade promotion when possible. Don’t forget that your event means more than what happens in the room on the day. How will you capture your event? Will you write a blog about it (if so, please send it to us for posting on the Festival blog post)? Will you photograph it? Will you film it? Will you share it on social media as it is taking place, and encourage your attendees to do so as well? Think about how you will document your event and tell the story afterwards. If your event goes on to have a life after the Festival, making real world changes in the teaching and learning at the University of Edinburgh and beyond – please tell us! Please remember to take attendance at your events and to prepare and send out a post-event survey to your attendees. It is so important to get a sense of what works and what can be improved, both for us as Festival Coordinators and for you as Event Organisers. Try to keep your surveys short and simple and make sure you are only asking questions that will supply information that will be useful going forward. We have a survey template in our resources that you can use if you like. Think about interesting and creative ways to evaluate your event – for instance, ask people to Tweet/post their reactions, or have them fill out a little sticky note ‘leaf’ and make a feedback tree for people to leave their thoughts on as they go. Hopefully I will manage to get through the Festival without a cold this year, though one thing is certain – I have Festival Fever and the only cure is a week of innovative, mindful, experimental, playful and joyful creative fun!